Trainer Matthew Scott says his eyes are firmly fixed on the Inter Dominion Championships with Glenferrie Typhoon after he won the Glenroy Chaff Trotters Mobile (2130m) at Gloucester Park earlier in the week. 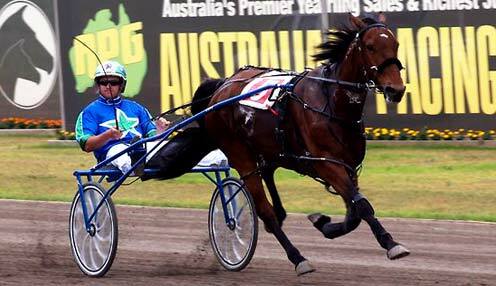 The trotter had spent five weeks away from the track which Scott admits is not ideal, but he was happy with the way he performed as the road to Melbourne continues. "It was pretty easy last night, he didn't have to do a lot," he said. "We want to try and race him fortnightly now up until the Inters. "There's been standing starts for the trotters, but no mobiles, so we were happy last night's one held up even though there was only six starters. "He had a good blow after last night, but Shannon (Suvaljko) didn't pull the ear plugs and said that he had a little bit in the tank still." Scott also heads to Gloucester Park tonight and has high hopes for a couple of his runners with Qtown Rip Roaring lining up in the JP's Sportsbar Open For Footy Finals Pace (1730m). "We have finally got a draw with Qtown Rip Roaring," Scott added. "We will be trying to lead throughout with him." Brookies Jet will also be first-up since winning at Northam on 29th May and says he has done enough work to run in the town rather than in the country. "He's been working very well," he said. "We've decided to go straight to town with him. "They split the two M0 races over 1730m and it feels like he is in the right race. I do expect him to improve on the run, but he is ready to go for the 130m."